Saint Brigid of Ireland was a good friend of Saint Patrick, who said she was destined for great things. As a child she was generous and kind to everyone she met. She could not keep from giving away everything to help the poor and this often got her in trouble. When she grew up, she became a nun and founded a church along with two monasteries, one for men and one for women. Later she founded a magnificent school of art, where the students learned metal work and illumination. The school produced the famous “Book of Kildare” which was so beautiful that it was said to be the work of angels and not human hands. Unfortunately, the book has been lost over the ages. One of Brigid’s symbols is a cross made of reeds known as Saint Brigid's Cross. Legend says that she made this cross out of reeds from the floor as she sat with her Druid father on his death bed. She used the cross to explain the faith and was able to convert her father before he died. Ireland is blessed to have such a creative patron who spread the faith through beauty. Another tale says that when Saint Patrick heard her final vows, he accidentally used the form for ordaining priests. When the error was brought to his attention, he simply replied, "So be it, my son, she is destined for great things." Little is known about Saint Brigid's life after she entered the Church, but in 40 she founded a monastery in Kildare, called the Church of the Oak. It was built above a pagan shrine to the Celtic goddess Brigid, which was beneath a large oak tree. 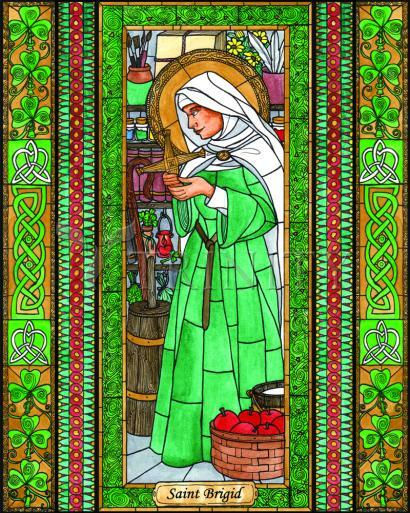 Saint Brigid helped many people in her lifetime, but on February 1 525, she passed away of natural causes. Her body was initially kept to the right of the high altar of Kildare Cathedral, with a tomb "adorned with gems and precious stones and crowns of gold and silver," but in 878, during the Scandinavian raids, her relics were moved to the tomb of Patrick and Columba. In 1185, John de Courcy had her remains relocated in Down Cathedral. Today, Saint Brigid's skull can be found in the Church of St. John the Baptist in Lumiar, Portugal. The tomb in which it is kept bears the inscription, "Here in these three tombs lie the three Irish knights who brought the head of St. Brigid, Virgin, a native of Ireland, whose relic is preserved in this chapel. In memory of which, the officials of the Altar of the same Saint caused this to be done in January AD 1283." A portion of the skull was relocated to St. Bridget's Church and another was sent to the Bishop of Lisbon in St. Brigid's church in Killester.